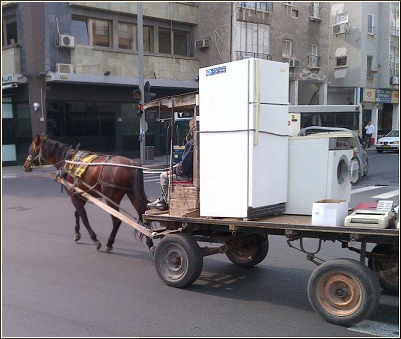 Hakol Chai (everything lives), the Israeli sister charity of CHAI, today appealed to Interior Minister, Eli Ishay, to issue a model bylaw for cities prohibiting horse- and donkey-drawn carts on city streets, following the example of Toronto, Beijing, Paris, London, Las Vegas and other cities worldwide. Photos documenting the suffering of animals forced to maneuver through congested city traffic hauling heavy loads poured in after Hakol Chai recently launched its Witness Campaign on Facebook, asking citizens to use their cell phones to document the animals’ suffering. Horses, often rented to peddlers for a few dollars per day, typically receive no veterinary care, inadequate food and water, are kept in unsuitable and dangerous living conditions and die a cruel death from exhaustion, malnutrition, disease and abandonment. Carts wending their way through cars and trucks and exhausted horses collapsed on the street disrupt the flow of traffic and endanger human, as well as animal lives. No minimum standards of care are required to obtain a permit to keep a horse, and because municipal authorities do not enforce local animal welfare regulations, most horse owners do not even bother to obtain a permit. Only the police and the Ministry of Agriculture have the authority to enforce the national Animal Protection Law, and do so rarely. Moreover, the law does not address the special problems faced by animals forced to work in urban areas. In general, horses and donkeys around the country are neglected, in terrible condition, go without veterinary care, and are not vaccinated against rabies, which presents a danger to human health. Hakol Chai’s letter to Minister Ishay urges that the model bylaw for cities with this problem include enforcement provisions. Specifically, it suggests that the numerous city employees assigned to daily issue tickets for cars parked in the wrong place be trained to issue tickets to owners of horse and donkey-drawn carts on city streets, where they, also, do not belong. Hakol Chai has campaigned for years to end the phenomenon of cart horses, exposing and ending instances of severe abuse and rescuing these animals. Hakol Chai’s efforts led to the Tel Aviv City Council calling a special meeting to address the issue, at which the organization’s formal proposal was discussed and the city’s municipal veterinarian admitted that the city lacked the resources to enforce welfare regulations. The city eventually agreed to a ban, but as a result of lack of enforcement, Hakol Chai has resumed its campaign, which is part of the international coalition Horses Without Carriages International. “It is inconceivable that in 2011, images of neglected, abused, injured horses, often collapsed on city streets or abandoned when they are too weak to continue, are still part of Israel’s urban landscape,” said Sahar.